These puzzles are pretty simple with 5 to 10 pieces each, but at the bottom of each piece, you’ll find a number that both helps put the pieces in order and learn and review skip counting. Great for kindergarteners and older preschoolers! Laminator and laminating pouches. Optional if you use heavy paper to print on. This is not a no-prep printable, but once you’ve prepared the activity, you don’t need any extra supplies and can pull it out at any moment. The puzzles would work great in a busy bag, too! The pdf file has a total of 10 pages and 10 different puzzles. There are four different 10-piece puzzles, two 5-piece puzzles, and four 6-piece puzzles. Print the file, laminate if you want (you can skip this if you use heavy paper; I like using scrapbooking paper), then cut the puzzles apart at the black lines. Please note that a heavier black vertical line separates two puzzles. The puzzles focus on skip counting by 5s. Two of the 10-piece puzzles, one 5-piece, and one 6-piece puzzle start the sequence at 5, while the other puzzles start with higher numbers. You can use one puzzle alone and have your kids put it together while paying attention to the numbers. 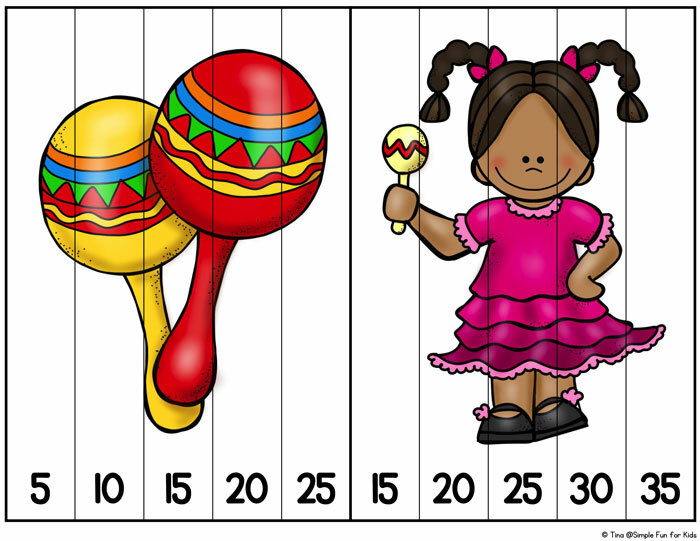 If they’re able, they can recite the numbers that follow in the sequence and/or those that come before the sequence. For a greater challenge, mix up the pieces from several puzzles. 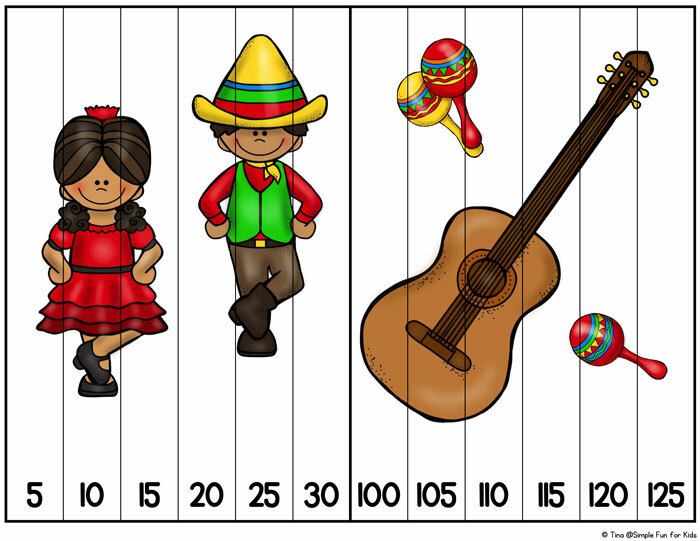 Images used are: Map of Mexico, butterfly in Mexican colors, colorful donkey, boy playing the guitar, girl playing the guitar, boy with maraca, girl with maraca, one maraca, two maracas, two different types of cactus, boy and girl dancing, guitar, Cinco de Mayo banner, bowl of chips, bowl of salsa, red, green, and yellow chilis. 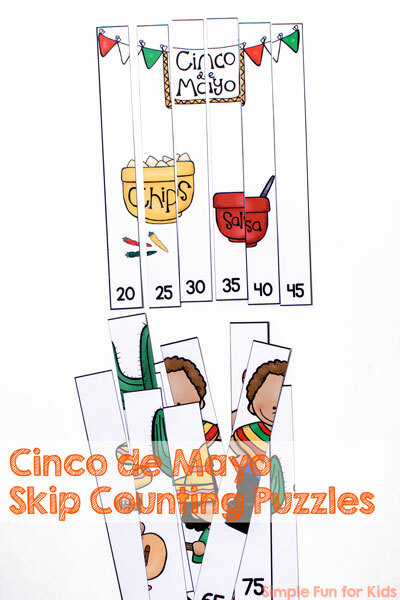 Download your Cinco de Mayo Skip Counting Puzzles!